It’s emails like these that make me realize just how much fellow ’67 enthusiast enjoy the labor of love efforts that go into 1967beetle.com. 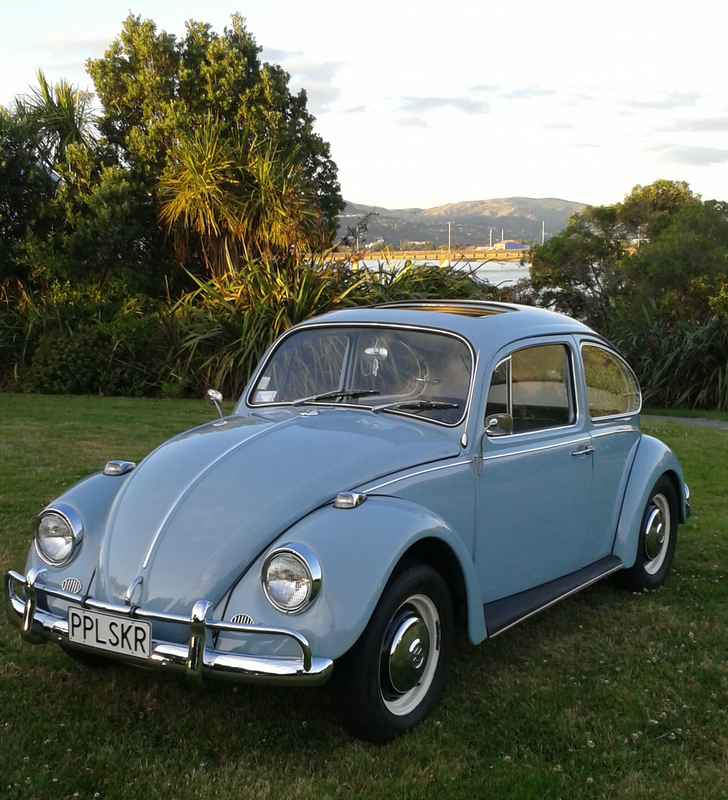 Thanks for writing Steve, and sharing your fantastic L639 Zenith Blue ’67 Beetle with the world. I’ve been a subscriber to your wonderful site for a while now, the regular emails are always welcome. I thought it about time I shared with you my unique ’67 Beetle story. 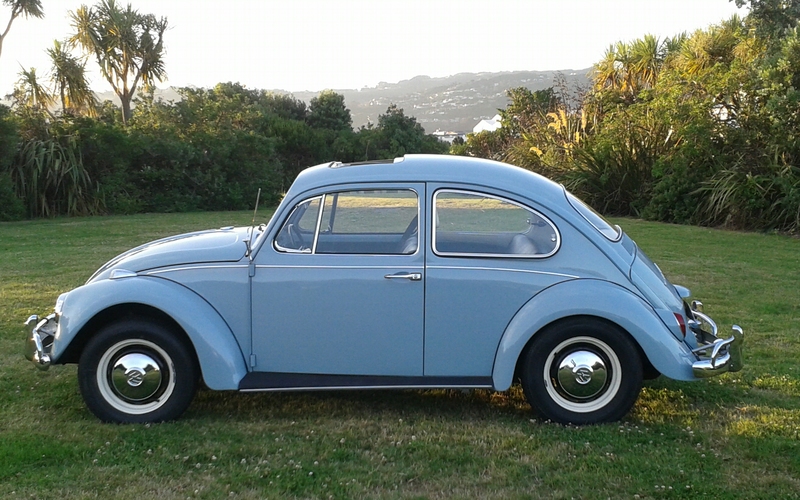 I own what I believe to be the only U.S spec 1967 Bug in New Zealand. The car was imported here in 1968 from Washington DC by the owner,Max Bumpers (Cool name huh) who was transferred down-under with ‘Operation Deep freeze’ a long-standing military joint venture between NZ, Australia & the U.S based in Christchurch, to monitor & protect the Antarctic. Most U.S staff bought cars with them as NZ had strict import restrictions in those days, making new cars here very expensive. The original owner never returned to the U.S and kept his bug until about 2004. I bought it from the second owner in 2006, he had the motor rebuilt and repainted the car in its original Zenith blue.The interior is still in factory paint. Since I purchased it I’ve added a TMI headliner and a few other bits and pieces, but have generally just maintained and enjoyed it. I’ve even won a couple of trophies at the NZ VW nationals with it. I’m an enthusiastic member of our local club, Kombined VW club Wellington, and have been an avid V-dub owner/ nut since 1984. Hope you enjoy the photos and my unusual story. Thanks, Steve, for sharing your ’67 with 1967beetle.com. Beautiful car, nicely photographed. Add some sheep to the picture and it could be a travel ad for New Zealand. What a precious car you have, Steve! It has EVERYTHING!! Made my heart swell. Its cousin, that I drove for years, answered to “Friendly.” Yours must have a much more elegant name. Great story; great looking car! Thank you, Steve. Thanks for the nice comments, contrary to popular belief though, we don’t have sheep roaming the cities any more :-) Having said that, you don’t have to venture far to find a farm. Some have asked me it stands for ‘people seeker’ which funnily enough it often has a tendency to do. I couldn’t help noticing your clear turn-signal/running light lenses. Are these a NZ “DOT” requirement? As far as I know, U.S. Spec bugs have had amber lenses since 1964. They look pretty cool, I’d like to have some. Not sure on that one Don, we used amber lenses here too. Maybe as they are also running lights on 67’s they were switched over in the 60’s to comply with regulations? I know the Italian VW’s usually had clear lenses, so you could give that avenue a try. One of the neat things about these cars are the stories behind them, and the people. Thanks Steve, it’s a beauty.